When detonated in strategic, population-dense, or confined spaces, bombs are especially destructive. For example, a bomb planted by political terrorists in a suitcase was responsible for the explosion of Pan Am Flight 103 over Lockerbie, Scotland, on December 21, 1988, that claimed 270 lives. Given the devastation that bombs can cause, and the risk they pose to national security, the detection of bombs is a important priority in airports and elsewhere. Despite the fact that x-ray examination may not detect some bombs, the technique is still a mainstay in bomb detection. For example, x-rays are the best way to reveal the presence in luggage of suspicious shapes. Plastic explosives can be molded to resemble common objects. Also, explosives are not metallic, and so will escape metal detection. A well-trained operator is a key part of this bomb detection strategy. A newer version of the x-ray examination places a reflector on the opposite side of an object from the x-ray beam. As the rays are scattered back, they are analyzed by a sophisticated computer program, which can reveal differences in the outgoing and incoming beams that were caused by passage of the beams through suspicious material. Another version of the x-ray dual energy technology sends two x-ray beams through the object at the same time. One of the beams distinguishes organic material (i.e., food, leather objects, paper) and displays them as red. The other beam distinguishes inorganic objects (i.e., metal clips, umbrella, metal pens) as green or blue. The color difference helps the operator quickly scan packages and baggage for object that are suspicious by their shape or chemistry. A similar method, which uses radio waves instead of x-rays, is called quadrupole resonance technology. 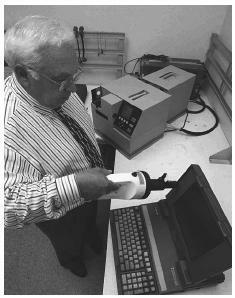 A dust sample is taken from a laptop computer and the particles analyzed for explosives residue by a Barringer explosives detection device. tomography, an object is scanned and then a computer analyzes the x-ray image. If areas of the package have not been adequately revealed, the x-ray source can be rotated so as to produce a detailed view of the specific area. In this way packages and baggage can be examined in great detail. Some bomb components can leave a scent. Until a few decades ago, specially trained dogs were a mainstay of bomb detection squads. Specially trained dogs are still used today to check out packages or locations that are difficult to examine using a machine. A dog's nose is actually a bit more sensitive than the sensitivity of detection machinery that is currently available. However, a dog and handler costs approximately $50,000 a year, whereas a piece of detection equipment represents a one-time cost of $20,000 to $40,000. Thus, machines are becoming more prevalent. One such technology utilizes gas chromatography and a property called chemiluminescence. In gas chromatography, chemicals of different composition can be separated from each other based on their differing speeds in a stream of gas (selection of the gas can determine the rate of movement of different compounds). A compound in the gas, which will then glow, will recognize an isolated compound that has a certain chemical group in its structure. The glowing (chemiluminescence) registers on an optical detector, revealing the presence of the explosive chemical. Devices known as sniffers detect vapor given off by certain explosives. Chemicals such as nitroglycerin are readily detected. But, a sniffer can miss explosives such as plastic explosives that do not readily vaporize. Thus, a sniffer should be used only as part of a bomb detection regimen that involves other detection techniques. The spectrometric technique is very sensitive. Less than a nanogram (10 9 of a gram) of explosives residue can be detected. To put this into perspective, a fingerprint on a luggage handle left by someone had been handling explosives will typically contain 100,000 times more of the residue. Green, Michael. Bomb Detection Squads. Mankato, MN: Capstone Press, 1998. Shubert, Hiltmar, Andre Kuznetsov, and Audrey Kuznetsov. Detection of Explosives and Landmines. Hingham, MA: Kluwer Academic Publishers, 2002. Yinon, Jehuda. Forensic and Environmental Detection of Explosives. New York: John Wiley & Sons, 1999. Sandia National Laboratories. "Miniaturization of chemical preconcentrators brings better bomb-detecting and drug-sniffing devices." Sandia Lab News. August 13,1999. < http://www.sandia.gov/LabNews/LN08–13-99/sniffer_story.html >(21 January 2003).